p a t c h: audio_visual_lab 2013 came to the end on Sunday 13th Oct officially, but in fact it lasted much longer as the emotions were very high after! 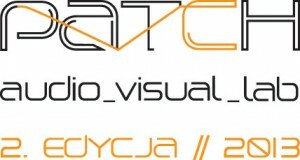 During the second edition of p a t c h 2013 we hosted 26 artists from USA, Germany, Netherlands, Italy, Mexico, Sweden, Hungary and Poland presenting 8 live-acts and performances, 12 audiovisual and interactive works and 7 av works from Open Call. Over 2500 visitors of the exhibition at the Contemporary Art Gallery Bunkier Sztuki during 2 days, extraordinary audiovisual night at Forum Przestrzenie, great atmosphere and amazingly good feedback from participants and visitors is the best prize for us as organizers. We would like to thank all the participants, partners, suppliers and visitors for their support, encouragement and commitment. PATCHlab would not happen without you! Check the video and photos here ! See you on the 3rd edition of PATCHlab in Krakow in 2014!